Living Reflections (from a dream): Come on the Garden County!!! For the first time in a laaaahhhhooonnnggg time, we can be proud of Wicklow GAA! Bloody hell - when have we faced Dublin before with such hope (and with such a manager - go on Mick!)?? Not in my lifetime, I can tell thee!! 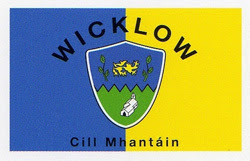 So, come on Wicklow - make us proud!